Schoon Laoshr has been teaching taiji since 1991. Her teaching experience includes serving as an instructor for the Kuang Ping School of Tai Chi, and the sole taiji instructor for Community Education at Irvine Valley College for six years. Schoon Laoshr has taught taiji, push hands, and sabre classes at the Irvine Fine Arts Center. She has taught taiji for employee wellness programs at several corporations in Orange County, including Fluor Daniel, Silicon Systems, and Baxter Healthcare. She has led taiji workshops for the Saddleback Community College District Staff, Yoga Arts in Huntington Beach, Taekwondo USA Family Center in Laguna Niguel, and Sei Shin Kan Martial Arts in Michigan. Currently, she is on the Faculty at Irvine Valley College and teaches for both the Emeritus Program and the Physical Education Department. Although her forte is the Guang Ping Yang style of taijiquan, she has studied Yang Short Form, in the tradition of Professor Cheng Man Ching, from two senior students of Master Abraham Liu. Schoon Laoshr is also experienced in the interactive taiji practices of Push Hands (Tui Shou) and the Two-Person Sparring Set (San Shou). She learned the traditional Taiji Sabre (Dao) directly from Yang Zhen Duo, 4th generation Yang family descendant, and studied Taiji Sword (Jian) with Chris Luth, Pacific School of Tai Chi and Master William C.C. Chen. More recently, she studied Taiji Staff from Master Tony Ho. In October 2001, Schoon Laoshr received two First Place medals in Guang Ping Yang form and Yang style Broadsword at the USA Wushu Kungfu Federation National Tournament. 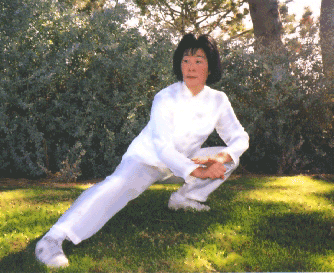 In 1992 and 1993, she placed among the top three in several events of the Northwest T'ai Chi Ch'uan Association's Exhibition at UC Riverside. She is a Charter Member and National Advisor to the Guang Ping Yang Tai Chi Association. For the past three years, she has been a local promoter for World T'ai Chi and Qigong Day, organizing a free, local event promoting tai chi for the public.